» Traffic on 2nd: How much, how fast? Traffic on 2nd: How much, how fast? These counters across Second Avenue were recording traffic volume and speed on June 2. Right about here, on Albany’s Second Avenue S.E., is where the city council wants to install a radar speed display sign in the hope of slowing drivers down. But first, the city wants to have good data on average speeds there now. That explains this arrangement of four “road tubes” across the street. I noticed them on a ride through town Saturday and assumed they had something to do with the council’s April 23 decision on the radar sign. The decision was to install it there, just west of the railroad tracks, and see whether it does any good. Albany transportation systems analyst Ron Irish confirmed my assumption. The road tubes, he told me, are collecting both volume and speed data for one week. The data will become a base to compare against new data once the radar sign is up. After the sign is installed, Irish expects to monitor traffic there for six months or longer. The idea is to learn whether the sign has any effect, and if so, whether the effect lasts over time or wears off. Once the data are in hand, the staff will report to the council and ask for direction: Continue with this sign? Take it down again? Or develop a program for additional radar signs elsewhere in town? The story has been edited to fix the street name. It’s Second S.E., or course, not S.W. A speed zone sign wouldn’t have any more effect than having a cop on every block waving a “Slow Down” sign. There are many people out there that believe their urgency is more important anyone else’s safety. They’re the same people that use their cell phones while driving. They also need to do this on 1st street! People think it’s a raceway drag strip and gun it after turning onto the street. Hey Hasso, here’s a question for Ron Irish if you have the time. I’m not advocating raising or lowering a speed limit or anything like that. I just don’t understand how posted speeds are set (unless it’s mandated by the state for state highways, like Pacific). Why is Waverly, with both oncoming traffic and left-hand turn lanes where cars are stopped set at 40mph and Second, which is one-way and constantly flowing traffic set at 25? Is it based on the total width of the street? Because both could be construed as residential/business. Thanks! Hasso – I contacted Ron Irish. I was not aware that ODOT sets all speed limits for city, county, and state. And as Ron said in his explanation, it is quite confusing. It is based on a number of criteria such as street length and width, number of driveways, accident history, etc. I wonder if road tubes are somewhat intimidating, causing their own slowdown, therefore the slowdown caused by the radar sign will be underestimated. 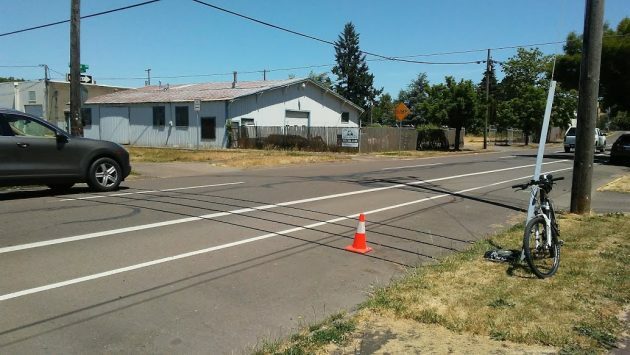 In Corvallis I often see radar signs, speed up as much as I can to get a respectable reading – on my bike. I like them, even when driving a car. They give me a chance to check my speedometer (rental cars). Anyone doing 50 at that point on 2nd is going to have a nice ride over the tracks very shortly. I get a kick out of watching the people in the left lane race the people in the right lane and jockey for position to make the right turn onto Main street. Every green light at 2nd and Lyon marks the start of a new race. Your conclusion has me a bit puzzled. If we don’t want to be badgered and bullied, then keep doing what we are doing? Speeding is the issue. Seems to me more drag racing around town will lead to more road tubes and radar signs. Are you advocating civil disobedience to throw off an objectionable burden. Seems both contrarian and liberal at the same time. Well I live on 2nd Ave right over the tracks. I’ve almost been hit three times trying to get in to my vehicle, constantly met by speeders trying to back out of my driveway below the hill of the railroad tracks. I saw a three year old child nearly hit at my neighbors house by a speeder. My dog was also killed by a hit and run speeder over the tracks. What am I to do? Toss bricks at speeding cars? (Then I become the problem) Chase them down and make citizen arrests? I’m tired of it. I have called the city and the police department several times. They have even put out these displays a couple times because of me. I say a stop sign at the tracks. Or a camera that mails a ticket for city revenue. They would get plenty of money to pay for the camera and a community message that says “Dont Do It”! Why not give a 2 month test so people get use to them and resume their “normal” ways. The newness of 4 hoses across the road is going to slow down people for a week or two. Just like the signs would do. These shame signs are being installed on Riverside Dr today. To the speeders, they are merely bragging signs.